There are a lot of chocolate brownies on the market. It seems like everyone is trying to perfect the ultimate chocolate brownies and while some make lifeless but technically perfect ones, others make less perfect but much more delicious ones. 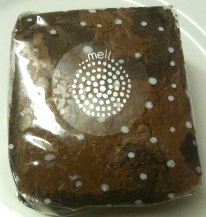 This is the type of brownie Melt Chocolate makes. I think they quite possible have too much chocolate in there which accounts for the extreme goeyness! 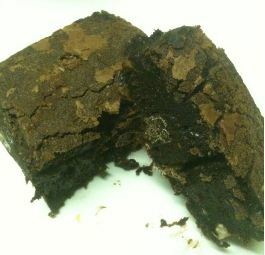 There is a delightful crust on the top like a brownie should and the thick dense chocolaty brownie is amazing. The chocolate is absolutely very good quality and the chinks make a delicious addition. The nuts are not too frequent for me and overall I think this is absolutely delicious. I can imagine having access to this brownie more easily would be dangerous as the delicious taste combined with ease of access would mean a much bigger Judith than the larger version currently available (from fine retailers only – limited time offer – non-returnable, non-refundable, must supply own chocolate). These are just to yummy and I don’t know how to possibly choose between this delightful brownie and the mud pie – so I won’t! You’ve really piqued my interest and curiosity, Judith, as I didn’t think it as possible to make a better brownie than Paul A. Young! I still dream about those delectable creations and can’t wait until I can return to the UK and buy more! By the way … I love your new blog design! Well done! All the best in 2012, and may you NEVER tire of chocolate!